Phi Phi Island is a tropical oasis nestled off the coast of southern Thailand. The towering, limestone cliffs that line the pristine beaches make you feel like you are walking through a post card. You may have heard of this island from the popular movie, The Beach, with Leonardo DiCaprio. In this movie, they show many shots of the nearby island and famous bay, Maya Bay. You can access this bay very easily from Koh Phi Phi, which brings a lot of tourists to stay here. 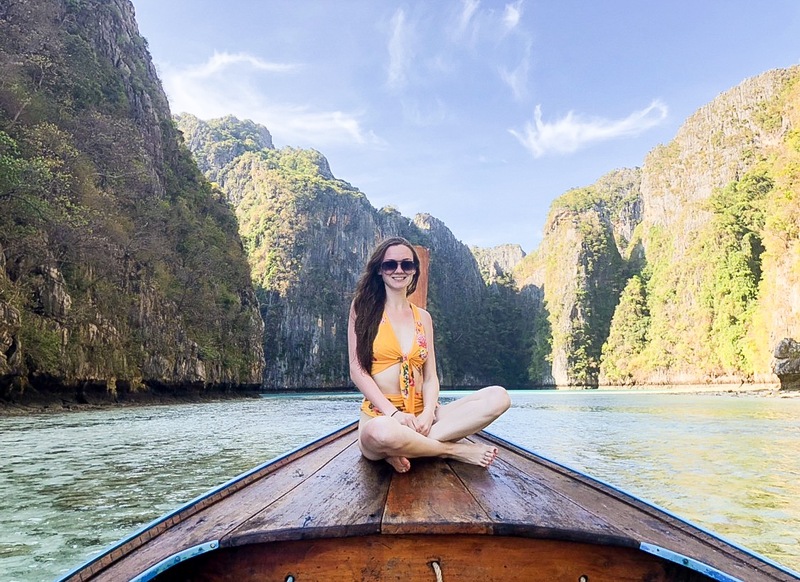 This excursion was included on my 11 Day Thailand Trip, but I decided to break it off into a separate guide because there are so many great tips I don’t want you to miss! To get to Phi Phi Island, you have to fly into either Phuket or Krabi and take a 1-2 hour ferry ride. TIP: Don’t plan on taking the last ferry out in case your flight is delayed or you miss the ferry. I would plan to reach the ferry for a 2pm or earlier departure time. When you arrive to Koh Phi Phi Island, the golden sand beach will be lined with long-tail boats. Most hotels will have a boat waiting for you at the dock to take you right up to your hotel. Unless you are staying at a hostel, then you will most likely have to lug your luggage up and down the winding streets. The nearby Maya Bay is flocked with tourists to the point you can’t even see the beach, so solution? Go before everyone gets there! TIP: Not only do you want to go to Maya Bay early to avoid tourists, but it is a National Park. They only allow a certain amount of tourists in per day. If you go too late, you may not be able to see it at all! Right when you get there, head to the main beach (right off the ferry dock with the long tail boats lining the shore) to negotiate a private long tail boat tour. There will be men in blue shirts waiting to offer you a tour. When you find a guy, ask if he is willing to take you before the sunrise. If he was anything like my guide, he will smile and say “Of Course, whenever you would like!” They don’t call it the land of smiles for nothing! Our boat tour was roughly $100 for 4 hours, for the entire boat. The next morning, wake up at the crack of dawn to start your adventure out to Maya Bay. You will be on the boat and heading to the island off in the distance when the sky is completely black. Your goal should be to watch the sunrise on Maya Bay’s beach when there is not a soul in site! If you go early in the morning, the tide will be a little rough. At times, you will feel like that tiny boat is going to tip over, but hey, that’s part of the thrill of travelling, right?! TIP: I am cursed with horrible sea sickness to the point where I can’t even stand in the ocean for too long without getting nauseous! However… I did this 6+ hour boat ride! If I can do it, anyone can! The distances between the destinations are short so you are hopping on and off pretty often. If you are nervous about getting sick, I would recommend going later in the day when the water is calmer. Enjoy your peaceful, quiet morning on Maya Bay until the tour boats and booze cruises start piling in. TIP: I would recommend staying here for a few hours or until the tide rises a little bit. Your next few stops will need a higher tide, so don’t rush! The limestone cliffs close in at the tip of the bay making the beach secluded with zero waves. The water is crystal clear with the most beautiful shade of blue! TIP: Go around the back of the island to find a lookout point! Our guide didn’t mention this and there is no signage pointing to it. We creepily overheard other travelers talking about it and tagged along. After Maya Bay your guide will take you to two snorkeling spots around the backside of the bay (where the lookout was that I mentioned previously). When we arrived, there weren’t too many fish – but we also went very early! If you stay at Maya Bay longer, the tide will be more calm and you should be able to see more fish. After you spend some time snorkeling, next stop is Pileh Lagoon. This place will make your jaw drop. Take your sweet time here because this will be the best stop of the day. Pileh Lagoon is a glistening, turquoise swimming pool in the middle of dramatic limestone cliffs. Park your boat, and cannon-ball right in! There are small beaches on the outskirts of the lagoon or you can work on your tan on the edge of the boat. We got a good workout jumping in the water / climbing back into the boat for the perfect boomerang, ha! Your next stop will be another snorkeling spot, Shark Point. The name of this location scares off a lot of people so it won’t be too crowded. My sister, being a dolphin trainer and all, is always on the hunt for wild marine life. She dragged me over to snorkel at “shark point,” which the name alone scares me!! The amount of people in the water made me feel slightly safer, because well, odds are better if a shark gets hungry! After several laps around the “shark point” we swam back to the boat, lost of all hope of seeing sharks. And then… out of the blue…. THREE SHARKS! They were actually adorable and a lot smaller than my scaredy-cat imagination envisioned them. Last stop: Monkey Beach! These little guys were so stinking cute! They walk right up to you and will grab food right out of your hand. Before going, I read to avoid monkey beach because they get aggressive… Boy am I glad I didn’t listen! Some of the bigger ones would get aggressive if the babies stole their food, but never with humans! I saw one guy bring pistachios and was extremely jealous watching all the baby monkeys flock to him to get their share. TIP: Bring pistachios so you don’t have to be a jealous bystander like me. This day will be relaxing and adventurous all in one. If you can stay longer in Phi Phi, try to! There are so many other excursions you could do to fill up another day: Bamboo Island, Koh Khai Islands, Mosquito Island, & more. I would recommend the private long-tail boat tour over and over again! Getting to beat the crowds at every stop made the trip that much more enjoyable. Want more guides on Thailand? 11 Day Thailand Itinerary – From Bangkok to Phuket! What to pack for summer in Thailand? Love your pictures, especially the one of you jumping off the long tail boat! When I went to Thailand last November, I was told that Maya Bay was closed so I went to Monkey Beach instead. The monkeys are so adorable but evil at the same time. They tried taking my stuff out of my backpack! Ya I didn’t bring anything with me other than my phone! They like to steal bags to look for food, ha!